The Plague Dogs 1982 : Childhood Terror And Animated Perfection. 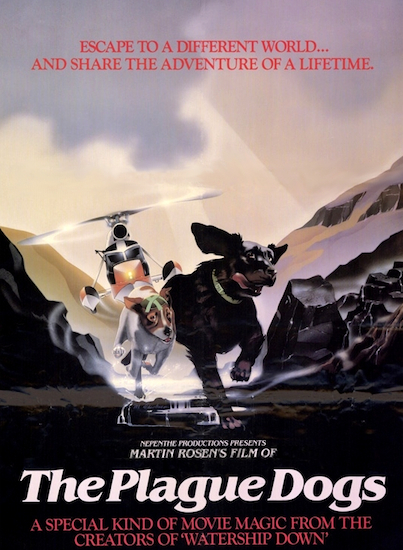 The Plague Dogs disturbed and horrified me as a child, more than any other film I had seen up to that point … animated OR live action. If you go into it with no prior knowledge of the film (or the original book by Richard Adams it is based on) then you are in for an experience that will stay with you for days afterward. No … Whoever came up with those taglines needs a slap. This IS a very special movie but there is nothing magical or adventurous about it, this is a brutal, depressing, grim, unrelenting and at times truly shocking animation. It hits you with despair and hopelessness from the very start and rarely lets up until the end. As the opening credits fade out you can hear the sound of splashing water and something gasping for breath … It is a Dog, a Labrador-mix called Rowf, he is struggling to stay afloat in a laboratory water tank. Its an endurance experiment (One he has been forced to complete repeatedly) … He drowns, the lab staff resuscitate him and prepare to do it all again, day after day. Its a very disturbing scene but it serves to show the viewer EXACTLY what to expect from the rest of the film. That night Rowf is able to escape from the laboratory with the help of a smaller dog (a Smooth Fox Terrier) called Snitter. Its at this point we find out they were being held within an animal research facility deep in the Heart of the Lake District. The animators make the most of this setting and paint bleak and ominous backgrounds every chance they get, its beautiful to look at. Cut-scenes show that the laboratory is becoming concerned by the sheep killing and the questions the local residents and farmers might start asking, this escalates, information gets twisted and by the end of the film the Army is dispatched to hunt down and kill the dogs over fears they could have come into contact with Bubonic Plague which was being secretly tested at the facility on rats. The dogs are also involved in the Deaths of two humans which further sends the situation spiraling out of control. Snitter accidentally kills a local farmer (The most shocking scene in the movie) when he excitedly jumps up at his chest and stands on the trigger of the shotgun the farmer is holding, blasting his face off … Then toward the end a professional hunter is startled by The Tod and falls to his death from a rock face. It is quickly revealed that the starving dogs ate parts of his body, which is briefly shown from a distance. The film was made by the same team that created the animated version of Watership Down so that alone should give you an idea of the quality and maturity involved here. The voice cast are excellent throughout … Christopher Benjamin gives Rowf a perfect World weary attitude, John Hurt is instantly recognisable as Snitter and James Bolam portrays The Tod with a thick Geordie accent. Nigel Hawthorne, Warren Mitchell and even Patrick Stewart can also be heard in smaller roles. I cannot recommend this film enough … Its animation at the very limit of what you would think was possible emotionally. It continuously punches you in the stomach and leaves you to recover, then just as you do it strikes again.